Almost £3m has been spent by the Ministry of Defence on RAF Leuchars in the last seven months, despite the base being threatened with closure. In a parliamentary answer to the North East Fife MP, Sir Menzies Campbell, the MoD confirmed it had spent £2.9m on redevelopment projects at Leuchars since 1 November. The government is currently carrying out a review of all its military bases. 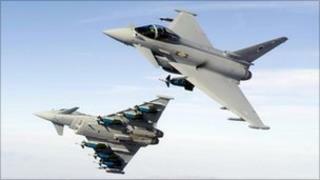 Both Leuchars and RAF Lossiemouth in Moray are thought to be under threat. Liberal Democrat MP Sir Menzies said: "These figures show that despite having the threat of closure hanging over it, work at the base is very much continuing as normal. "It has already been demonstrated beyond doubt that RAF Leuchars is in the ideal geographical position to fulfil its duty of policing and protecting northern British airspace. "The significant investment which continues to be made in the base will ensure that it is perfectly equipped for this role. "If the government agrees with me that RAF Leuchars is in the right place, at the right time, and doing the right job, it needs to put its mouth where its money is and confirm that the RAF will stay in Fife."